In addition – the USA will have exported around 4.5 tonnes direct to the Chinese mainland, and Jansen also comments that South Africa doesn’t break down its gold export figures so he may well suspect that some is going in from there too – but the amounts will be relatively small so we can stick to 1,300 tonnes as a nice round figure. Add to that China’s own gold output, estimated by Jansen at 453 tonnes and there will also have been a scrap gold element to be taken into account. This suggests that China ‘consumed’ around 2,000 tonnes of gold in 2016, which equates quite closely to the Shanghai Gold Exchange (SGE) gold withdrawals figure for the year of 1,970 tonnes – (See: 2016 SGE gold withdrawals lowest for four years). This would seem to confirm Jansen’s oft-made assertion that SGE gold withdrawals are equivalent to total Chinese gold demand – a premise largely dismissed (perhaps without any adequate reason) by the major gold consultancies which virtually all put Chinese demand at less than 1,000 tonnes. In part, this discrepancy relates to what the major consultancies label as ‘demand’. They tend to ignore what Jansen labels as institutional demand which he puts at at least 778 tonnes plus, depending on the amount of supply from scrap sources. In terms of Chinese gold flows though, all the above figures ignore Chinese central bank demand. While this, at least in terms of reported additions to its gold reserves, appears to have slipped in 2016, it still came to a little over 80 tonnes – so overall gold flows for China last year look to have been in excess of the 2,000 tonnes noted above, although not by much. This equates to 60% plus of the total of global new mined gold in 2016. See our own take on the Swiss December figures: China 154, Hong Kong 39. Swiss Dec gold exports show remarkable gold flows. We have long been pointing out the decline in importance of exports from Hong Kong to the mainland in the overall Chinese gold import figures. Perhaps our message will eventually get through to much of the mainstream media – and some ‘expert’ commentators and analysts – who continue to ignore this point and continue with headlines which appear to collate Chinese total gold imports with those coming in from its Special Administrative Region! The latest gold import and export figures into and out of Switzerland both showed huge increases in December with exports to China a particularly notable 158 tonnes compared with a rather small 30.6 tonnes in the previous month. With gold flows into the Chinese mainland from Hong Kong also picking up in December this represents pre-Chinese New Year holiday demand and may also have been boosted by the lower gold prices prevailing in the final quarter of 2016. Switzerland has always been a major conduit for gold flowing into stronger Eastern hands. That into China for example stays there and doesn’t come out again. The private Swiss gold refineries, Valcambi, Metalor, Pamp and Hereaus all specialise in re-refining gold scrap and 400 ounce good delivery gold bars into the smaller, mostly kilobar, sizes in demand in the Middle and Far East. But most significant in the latest figures were the exports recorded to China of 158 tonnes – and given that China imports gold directly from a number of other sources too – this suggest a huge pick-up in Chinese demand at the end of a particularly weak year. We have already pointed to a sharp fall in Shanghai Gold Exchange (SGE) gold withdrawals over the year (See: 2016 SGE gold withdrawals lowest for four years) which is symptomatic of the same overall reduction in gold demand in China over the full year, but whether the big rise in December imports from Switzerland is purely due to demand ahead of the Chinese New Year, or is gold price-related following the dip in US dollar bullion prices immediately following the US Independence Day holiday in July, is uncertain – but probably a combination of both. The above graphic from bloomberg.com demonstrates the huge increase in Chinese gold imports from Switzerland in December. We have highlighted the strange Swiss gold import and export statistsics which have been prevailing so far this year on this site and others for which I write. The June stats from the Swiss Customs Administration have now been announced and these anomalous gold flows are apparently continuing apace. Switzerland has been seeing some huge reversals in imports and export data for some countries with a prior strong source of Swiss gold exports now the leading supplier of gold imported into the Alpine nation in the UAE, while the UK, in the past a major source of gold imported into Switzerland, has been the principal export destination so far this year. I have noted some correlation between these reversed gold flows and the rise in the gold price this year, the drop in Asian demand and the big flows into the big gold ETFs, and comment on this in two articles – one on seekingalpha.com and the other on sharpspixley.com. Swiss Gold Stats Point To Big Continuing Supply/Demand anomalies. This is an edited version of a previously published article, but with the addition of illustrative bar charts of full country by country data which emphasise the anomalies pointed out in the original article. The charts ore from Nick Laird’s excellent sharelynx.com webite, received, in this instance via Ed Steer’s edsteergoldandsilver.com service. The latest gold import and export data from Switzerland, one of the few countries to report these flows in detail, as usual open up some interesting insights into global supply and demand. Overall Swiss gold exports rose by around 20% month on month to 177.3 tonnes making the country a net exporter in May. Generally Swiss gold imports and exports are pretty much in balance given that they mostly comprise imports of gold for re-refining and re-export. While gold exports from Switzerland to China and Hong Kong both picked up in May, its principal country of imports was again the United Arab Emirates normally a recipient of Swiss gold, not a provider. The import volume from this source, which has little or no domestic gold production, at 30% of the total could be seen as truly remarkable. Indeed in another reversal of normal gold flows, the U.K. was again the biggest importer of Swiss gold in May, necessary, we feel, to meet the big demand in London from the principal gold ETFs which vault their gold there. Again, the UK accounted for 39% of Switzerland’s total exports – a bigger total than exports to Hong Kong, China and India combined! This is the third month in a row of significant Swiss gold exports to the UK, whereas in past years the UK has usually been the biggest exporter of gold to Switzerland. Exports to the U.S. were also unusually high. Again any gold flows to and from the U.S are normally in the eastward direction. We have surmised before that available supplies of physical gold in London are currently tight and this only serves to add weight to that premise and could also suggest that a similar position is arriving in the U.S. too given recent strong investor demand for bullion. UK bullion investment has also been exceedingly high in the runup to the Brexit vote – a wise investment for those in the UK who took our advice to buy gold as wealth insurance in case the UK voted to leave the EU as has happened. We described this as a no brainer back a couple of weeks ago – Britain Facing Brexit Bombshell. What Would Happen to Gold?. We hope readers took our advice. Re China and Hong Kong, exports to the Chinese mainland were 19 tonnes, up from 13.8 tonnes in April, while exports to Hong Kong were up by a very large 14.5 tonnes to 24 tonnes making the percentage of gold shipped to the Chinese mainland against that shipped directly to Hong Kong (which will also subsequently nearly all find its way to mainland China) at around 44%. This again confirms our oft-repeated mantra that Hong Kong gold imports and exports can no longer be taken as a proxy for the Chinese figures with so much gold now going to the Chinese mainland directly. This is a major change from three years ago when the Hong Kong:China ratio was far higher, but still some media outlets ignore this fact. Prior to the current year, The U.K. was always a significant supplier of gold to the Swiss refineries which have specialised in melting down and re-refining 400 kg good delivery gold bars into the smaller sizes most in demand in the Asian markets. Thus, as we pointed out a month ago when the previous set of Swiss stats were released – See: Swiss gold data raises new doubts on London’s gold stocks these reversals of gold flows, if they continue, could be an indicator of some serious tightness in supply of physical gold to the markets from traditional sources as noted above. While exports to China and Hong Kong were substantially higher in May, they remained very weak a was the flow to that other traditional gold market, India, where gold seems to have fallen out of favour in recent months. In May the figure was only 18.5 tonnes, down 16% from an already low April figure. Taken together with reports of substantial discounts in the local gold price, it appears that Indian buyers are nervous of the substantial gold price rise so far this year and may be holding off purchases in expectation of a price fall. Not a good policy in the event. The other big anomaly in the figures was that the two biggest exporters of gold to Switzerland in May were the United Arab Emirates again with 42.1 tonnes and Hong Kong with 11.6 tonnes although the latter was a net importer in May – not the case in April. Neither of these countries/regions are normally exporters of gold to Switzerland in any significant quantities, but are major trading centres, suggesting that the lower demand from what are probably their biggest normal export markets, India and China respectively has led to inventories running higher than traders are happy with, and with the higher prices prevailing there has been perhaps an incentive to return gold to the Swiss refiners and take profits. We will thus be following this Swiss import/export data to see if these supply/demand anomalies continue in future months. The importance of Hong Kong as a channel for Chinese gold imports continues to diminish with nearly half of Swiss June gold exports going direct to the mainland. One of the biggest exporters of gold to Hong Kong and China is Switzerland, and luckily we have official Swiss statistics to throw a little more light on this subject. In June total Swiss gold exports totalled just under 100 tonnes with 32.3 tonnes going to China and Hong Kong combined. But of this total fully 43.6% went direct to the Chinese mainland, bypassing Hong Kong altogether which makes the Hong Kong export figures to China less and less indicative of overall Chinese gold imports. Indeed for the whole of 2014 around 37% of Swiss gold exports to China and Hong Kong – which together amounted to 600.3 tonnes – went directly to the Chinese mainland without first landing in Hong Kong. It is perhaps fair to assume that gold exports to mainland China from other nations is also seeing an increase. As can be seen from the above chart, India, Hong Kong and China between them accounted for 54% of total Swiss gold exports, and if one adds in other south Asian and east Asian nations the area accounted for around 65% of all Swiss gold exports that month. Recent Reuters headline: China’s gold imports from Hong Kong dipped to 7-month low. The brief article which followed implied that Chinese gold demand was also dropping in commenting that Honk Kong imports remain a proxy for Chinese gold demand. They used to be, but not any more! Now we don’t know exactly what proportion of Chinese gold imports are now going in directly and bypassing Hong Kong, but judging by the Swiss export data it could be as much as 50% or more and while Hong Kong obviously remains a significant route for the gold imports it looks to be becoming less and less relevant – particularly given further restrictions being lifted on the number of banks and companies allowed to import gold directly. Thus the days of Hong Kong figures being relatively close to providing a very good idea of total Chinese gold imports would now definitely seem to be ending which will make estimating overall Chinese gold imports ever more difficult given that mainland China does not report this data. But on the basis of the latest Shanghai Gold Exchange withdrawal figures which are, if at least nothing else, an excellent trend indicator of overall Chinese gold demand, the Asian Dragon could be heading for a record year for gold demand with around 780 tonnes withdrawn so far this year from the Exchange up until one week ago. While it is far too early to make an annual estimate given these flows out of the Exchange tend to fall off mid-year, before picking up again from September onwards, should withdrawals continue as expected we could well be in for a comfortable new record come the year end. Julian Phillips’ commentary on what is currently driving the gold and silver markets – and market action overnight and this morning. Isn’t it infuriating? The Technical picture has no discernible pattern at the moment, but pointed down to most people, yesterday. But prices went up instead, as Asian demand filtered through constantly, pushing short positions to close once again. To illustrate just how strong Asian gold demand is the Swiss reported exports of re-refined gold [in the 1 kg range] of 46.4 tonnes of gold to China and a larger number of 72.5 tonnes of gold to India up from 23.6 tonnes and 27.1 tonnes of gold respectively for February. Please note that this was not for a specific festival [the main one was in April] but a general stocking up. This increase in tonnage has much more to do with low prices that went to gold’s low of $1,143. The demand from China was not festival driven either. Traders with an eye on currencies saw the need to lift the gold price, when others felt the opposite. So we are seeing the waters of the gold market roil and make them turbid [boiling and unclear]. So where do we go from here? We can only say, as we said above, in the forecast. Today E.U. Finance Ministers meet in Riga to discuss Greece. It is these Ministers who will decide on the matters so Merkel’s meeting with Tsipras did not change the likelihood that no deal will be reached there. It’s the accountants that hold the power not the politicians at this moment, but at the end of the day we feel the politicians will win out. This story will drag out all the way, it now seems, right through June. The exchange rate of the $:€ will not be affected by Greece until a conclusion is reached one way or the other. Until then it is all about the dollar and its strength. The dollar index fell to 97.18 after yesterday’s 98.16 with a stronger euro at $1.0833 now. Gold is back in consolidation mode for the weekend, it seems. There were no purchases or sales of gold into the SPDR gold E.T.F. or the Gold Trust on Wednesday. The holdings of the SPDR gold ETF are at 742.347 tonnes and at 165.58 tonnes in the Gold Trust. New York closed at $1,194.70 up $7.90 on Thursday in NY. Asia held it there before the LBMA Gold price was set at $1,192.15 up $4.90. The euro equivalent stood at €1,099.87 down €5.84 while the dollar was stronger at $1.0834 against yesterday’s $1.0742. Ahead of New York’s opening, gold was trading lower in London at $1,192.30 and in the euro at €1,101.74. The silver price closed at $15.89 up 10 cents on Thursday. Ahead of New York’s opening it was trading at $15.87. How much gold is now going directly to mainland China? 36%? Latest precious metals export data out of Switzerland for the full 2014 year suggest that in that year, taking gold specific exports only, around 36% of the gold exported to Hong Kong and China combined actually went directly into China rather than via the former British Crown Colony. As various reports in the media have suggested, India was the biggest recipient of Swiss gold at 471.2 tonnes, but China and Hong Kong, which after all is a special administrative region of China, together took in 590.4 tonnes, further suggesting China, contrary to some reports, remained the world’s biggest gold consumer last year.. Totals Swiss gold exports for the year were some 1,746 tonnes and the top 10 importers of Swiss gold in 2014 are set out in the table below. 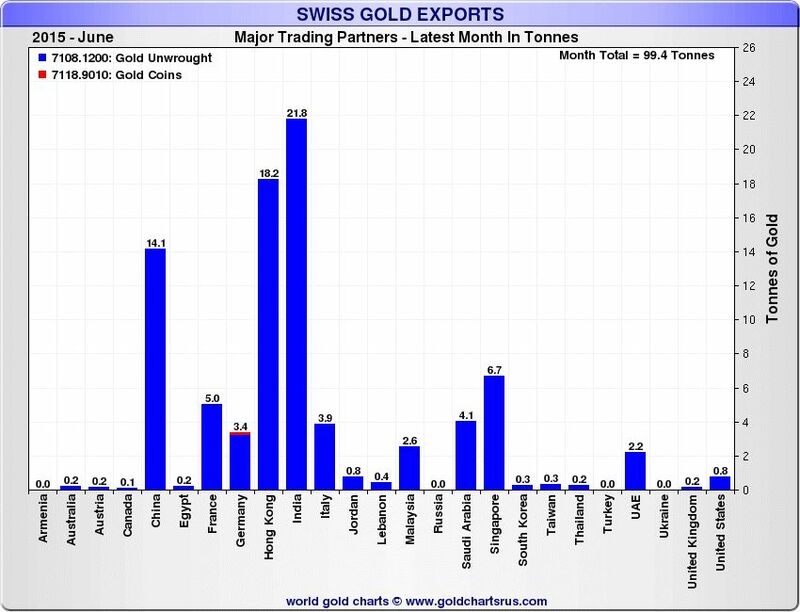 Between them they account for over almost 90% of all Swiss gold exports. The next three most significant importers of Swiss re-refined gold were France with 37 tonnes, the UK with 29.8 tonnes and Malaysia with 22.6 tonnes. So what is the significance of this? For many years very little gold was imported directly to mainland China. Nearly all came in via Hong Kong. So Hong Kong (which published its gold import/export data) was widely seen as a proxy for total Chinese gold imports. China itself didn’t publish such data so what might have been coming in directly was widely disregarded by Western analysts as of no consequence. But last year, China moved the goalposts, and eased the path of gold imports directly to the mainland from other countries than Hong Kong. However because China doesn’t publish direct gold import data no-one really knows exactly how much gold is now flowing into China directly and although Hong Kong is now not the only significant import route Western mainstream media often imply the Hong Kong data still equates to Chinese demand – so the recent news that exports from Hong Kong to China fell 32% last year was widely seen as an indicator that Chinese consumption fell by a similar amount. Thus the latest official export data from Switzerland (as do the latest figures for U.S. gold exports) show that for a large part at least of China’s gold imports, around a third are now going into China directly which makes the Hong Kong figures ever less indicative of the overall picture. The other interesting point from the Swiss statistics is that this small nation takes in, re-refines and then exports a volume of gold equivalent to around 56% of the world’s newly mined annual gold supply. The volumes of gold being exported to other countries than India and China/Hong Kong are also worthy of note – particularly imports into Singapore and Thailand being other key Asian gold consumers – and Saudi Arabia, Turkey and the United Arab Emirates, which between them accounted for as being strong indicators of Middle Eastern demand. Between them these three states imported 195 tonnes of Swiss re-refined gold – some of which was doubtless destined for Iran and Islamic State, both of which are cut off from direct gold supplies from normal sources. Gold exports and imports can be a murky business at the extremes!